Eric Ruschky of Columbia, South Carolina, who was diagnosed with myeloma in 2004, is now in near-complete remission. Aug. 16, 2018 | “My primary care physician called me in and asked me if I knew a good oncologist,” said Eric Ruschky, 70, of Columbia, South Carolina. In addition to the homemade bread Eric and Mary Ruschky share with the UAMS Myeloma Center staff, Eric brings smiles with his wigs. (UAMS) where he’s been a patient ever since. During his first year of treatment under the care of Guido Tricot, M.D., Ph.D., Ruschky underwent chemotherapy treatments and had tandem stem-cell transplants. Tricot practiced at the UAMS Myeloma Center from 2001 to 2007, during which time he and his colleagues pioneered the use of a treatment technique that increased the median survival rate for newly diagnosed patients from 2 ½ years to 10 or more. During his first round of chemotherapy, Ruschky almost, but not quite, dodged losing his hair. “I had my treatment and was doing well but none of my hair had fallen out,” he said. “I began to think ‘Maybe that’s not going to happen to me.’” Heading home to South Carolina, he made it to about Alabama where it started coming out in the shower the next morning. Arriving home, it was time for him to go shopping for a new vehicle. “I pulled out two fistfuls of hair,” he said. “And I cried,” added his wife, Mary. Ruschky has retained the sense of humor he first displayed at the car dealership and further encouraged when, back in Little Rock for his second round of chemotherapy, a friend from home sent him an outlandish wig. “I think it’s supposed to be Rod Stewart or Tina Turner,” said Ruschky of the spiky reddish-golden wig, adding that he sports it on his annual visits to UAMS. Through the years, gift shop employees helped him embellish his look, adding accessories like a feather boa or a pair of sunglasses. Visiting Scotland in 2009, he came across a second wig he brings with him for variety. Meanwhile, Mary reaches out to those at the Myeloma Center who have cared for the couple through the homemade six-ingredient bread she’s been making for 30 years and brings with her every visit. The yeasty treat has become a popular tradition with employees. During the times when her husband was undergoing treatment and their stays here were longer, she’d bring the starter with her and make it once a week to share with employees as a unique expression of gratitude. Now that they visit just once a year and for a shorter time, she bakes the bread at home and brings it with her. 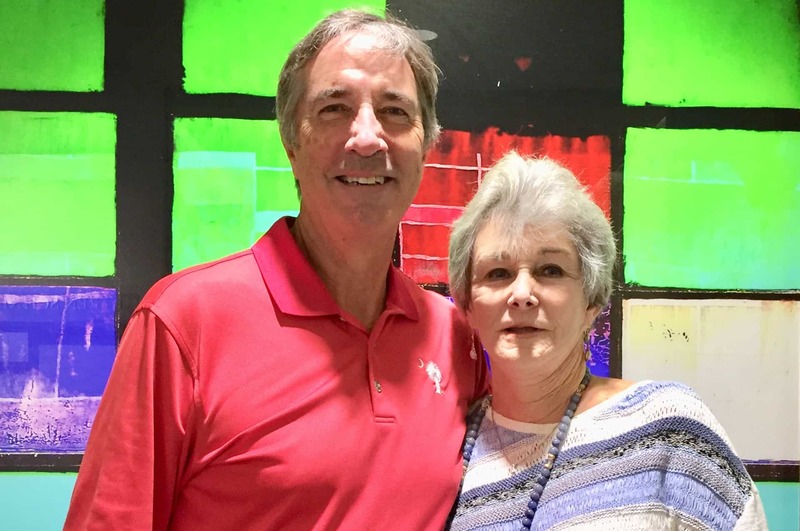 “People at the Myeloma Center have gone out of their way to make our visits there as pleasant as possible,” Ruschky said, adding that the same warm hospitality is also found among Arkansans outside of UAMS. Like John and Priscilla Youngblood of Little Rock, both originally from South Carolina, who opened their home to the Ruschkys during Eric’s checkups, even letting the Ruschkys stay in their home when the Youngbloods were out of town. The Youngbloods’ daughter, Sherri, is a registered nurse at UAMS. Others extending hospitality to the Ruschkys include then-Arkansas governor Mike Huckabee and his wife, Janet. The pair met the first couple at Huckabee’s book signing in Columbia, South Carolina, and struck up a friendship. Their conversation about Christmas decorations led to Janet inviting the pair to stay at the Governor’s Mansion for several days in December 2005 when the Ruschkys returned to Little Rock for a checkup and took them up on their offer. When Mary, an avid tennis player, needed to find a pro she could call on with little or no notice as an outlet during her time as a caregiver, Raul Bermudez understood. The couple first met the tennis pro in 2004 and he has been a friend ever since. Eric’s treatments ended in July 2005, followed by a year of maintenance chemotherapy administered in Columbia. Today, Eric is in near-complete remission and no longer has any medicines prescribed for myeloma. And when he meets other myeloma patients, he recommends they come to UAMS for treatment.